Peter Salerno Inc. Featured in (201) Magazine’s Holiday 2013 Issue! – Design Your Lifestyle. Peter Salerno Inc. Featured in (201) Magazine’s Holiday 2013 Issue! If you walk around the office at Peter Salerno Inc., chances are you’ll run into more than one copy of (201) Magazine. That’s because we think (201) Magazine is a must-read for business owners, shoppers and residents of Bergen County – and northern New Jersey as a whole. Needless to say, we were thrilled when the staff at (201) Magazine contacted us about a piece in their Holiday 2013 issue. The article focuses on Peter Salerno and his family, continuing the Salerno legacy of master craftsmanship into its third generation (all starting with Peter’s father Ross). Our article features Peter, his wife Tracy, their children Anthony and Gabrielle, and Anthony’s wife Eve, sitting in the “showcase” display of our state-of-the-art Wyckoff, NJ, showroom – complete with customized La Cornue Chateau range and reclaimed Route 66 tin hood and Swarovski-encrusted tin ceiling. 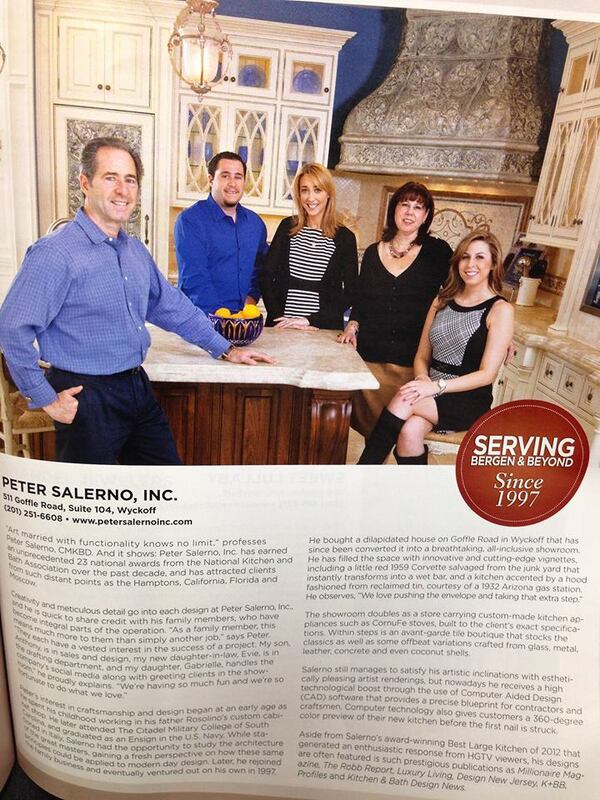 Peter Salerno Inc. and (201) Magazine share many things in common. We are both proud stalwarts in the Bergen County community, are humbled by and proud of our loyal clientele, and live to serve those who place their trust in us. These are just a few reasons why we are happy to align ourselves with this outstanding publication. The lead editorial staff at (201) Magazine – Amelia, Laura, Heather, Deidre and Melissa – are all outstanding to work with and display first-rate journalistic talent. It’s a joy to continue a working relationship (and personal bond) with them – if you get the opportunity to work with or know them, we urge you to do so! Residents of Bergen County, New Jersey, can receive a complimentary subscription to (201) Magazine by clicking here and following the instructions. For more information about our company or this article, please contact Peter Salerno Inc. at 201.251.6608, or email info@petersalernoinc.com.